Zanzibar is one of the best honeymoon destinations in Africa. This dreamy island offers the perfect back drop for a romantic honeymoon getaway. Spend your days exploring the island, the ocean, the wildlife, and interacting with the people of this beautiful paradise. Spend your nights dining in the finest Stone Town restaurants, exploring the Zanzibar nightlife. Create lasting memories during your Zanzibar honeymoon. Memories that will last a lifetime. Our Zanzibar honeymoon packages are designed to offer you an your spouse an unforgettable awesome experience. 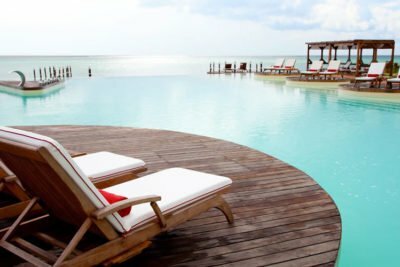 We have hand-picked some of the best hotels in the top honeymoon destinations in Zanzibar to create the best Zanzibar honeymoon packages. Check them out. Perfect spot for a romantic holiday or honeymoon in Zanzibar. 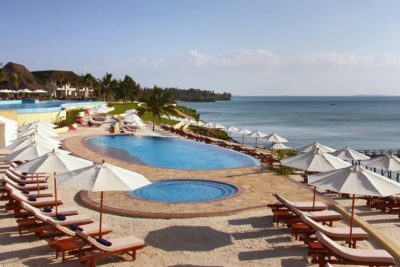 This resort in Zanzibar is right on an untouched beach on Zanzibar’s east coast and about 50 minutes away from the Zanzibar International Airport. 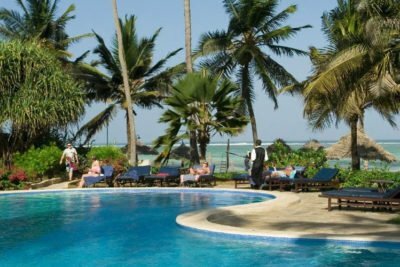 Located on the stunning white sandy beach on the South East Coast of Zanzibar this an all villa resort, lies ideally secluded near the charming village of Paje. 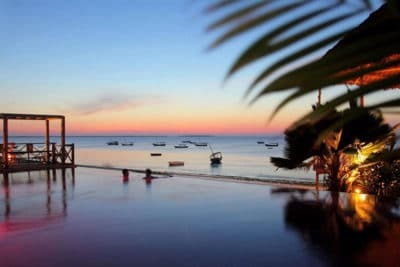 Just what you need for a honeymoon or romantic holiday in Zanzibar. One Complimentary 30 Minutes Neck, Back And Shoulder Massage For 2 Adults At Blossom Spa. This beach house in Zanzibar provides a refined context and excellent services in a breathtaking location.Honeymoon or Holiday in Zanzibar? Celebrate unique moments on the beach of this tropical island. Flower Decoration In The Room Upon Arrival. Located on the Michamvi Peninsula, on the South East Coast of Zanzibar - one of the most authentic and secluded places on the island - and overlooks the wonderful Chwaka Bay. 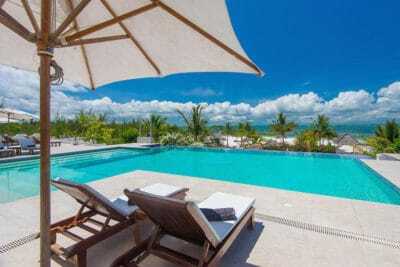 Get an undiluted Zanzibar holiday experience here. 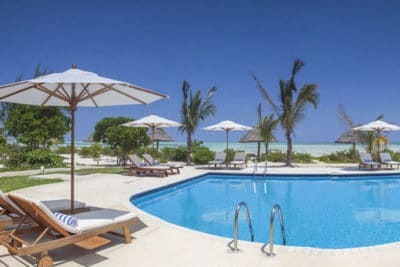 For the luxury Zanzibar holiday or honeymoon. This is the resort. Featuring thatched roofs and exposed beams, the 7 luxe villas come with private gardens and pools. 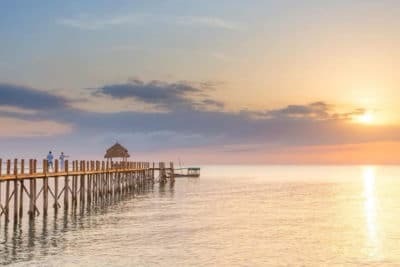 Things to do in Zanzibar while on a Honeymoon. There are many wonderful excursions to take part in while you’re in Zanzibar for your honeymoon. Below is a collection of some of the best things to do as a couple. Pick one or two and spice up your Zanzibar honeymoon. Take a sunset dinner cruise on a traditional Dhow. Watch the sun set over the Indian Ocean, an unforgettable moment with the one you love. This will be a highlight for your honeymoon in Zanzibar. Those that have experienced the sunset from land and sea say that there is nothing like floating back to your personal paradise with the golden sun setting beyond the water you’re floating on. Take a day of your honeymoon in Zanzibar and explore Menai Bay with a Safari Blue cruise, a full day excursion that offers a multitude of aquatic experiences. Menai Bay is a protected bay that creates a sanctuary for humpback whales and bottlenose dolphins. Guests encounter dolphin sightings on most of the voyages, sometimes multiple times per day! Voyagers explore the sandbanks around the bay, snorkel through the Indian Ocean, feast on fresh seafood and local fruits, and explore the island trails around the bay with their fellow shipmates before gliding back to Stone Town for a memorable evening on the town with your sweetheart. 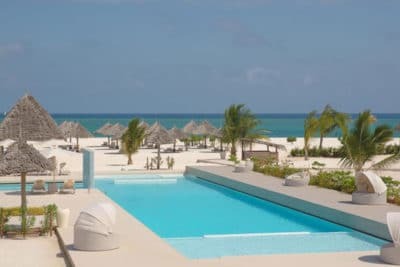 If you would like to have a private ourdoor moment during your Zanzibar honeymoon, escape with your sweetheart to a lunchtime sandbar meal where you’ll spend your time completely secluded from the rest of the world. 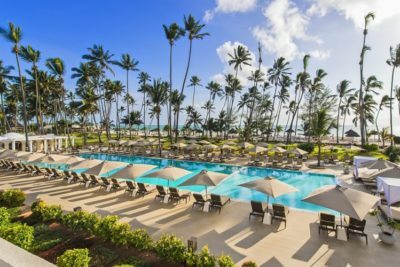 Feast on your favorite island foods, sunbathe, and swim in the clear waters that completely surround you and your partner. End one of your sun soaked days with a romantic Zanzibar honeymoon dinner at the Serena Inn, one of the finest dining experiences you can find at a Stone Town restaurant. 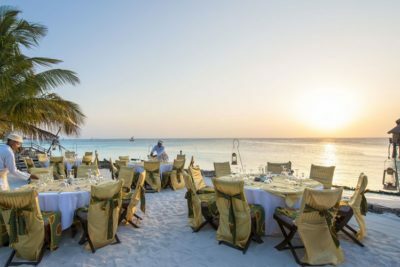 Listen to the waves of the Indian Ocean lap against the stones just beyond your table as you dine on international and Swahili cuisine. The Baharia Restaurant and The Terrace Restaurant offer an unforgettable evening filled with aroma of seafood and spices, surrounded by Omani carvings and Persian rugs. This dinner may end a magical day in the sun, or begin an evening of dancing and drinks in the Zanzibar night life! Crown your Zanzibar Honeymoon, float off to the Rock Restaurant for one of your getaway lunches. This is one of the most unique dining experiences of your life! The Rock is located off the east coast of Zanzibar, on an island just big enough to hold the restaurant! Drink fine South African wine, dine on fresh seafood, and finish with homemade ice cream or coconut tiramisu all the while being completely surrounded by a stunning view. A three hundred sixty degree view of clear water and active sea life! Explore the Mtoni Palace Ruins and dine in the palace of Sultan Sayyid Said, one of the oldest buildings on the island. Although, the palace has deteriorated it is a glimpse of the way Arabian royalty lived on the island of Zanzibar. Experience a concert in the courtyard, whose proceeds support the conservation of the ruins. Take a Princess Salme Spice tour, beginning at the ruins, explore the Persian baths, take part in a coffee ceremony at the Bububu house and more. If a faster pace is more your style spend a half day or full day on a Quad Adventure! These four-wheeled motorized all terrain vehicles provide the perfect way to explore the northern area of Zanzibar on off road trails in an exhilarating fashion. Departing twice a day from Kiwengwa and carrying two people at a time, take off with your darling with a group tour. Trek from Kiwengwa to Mchangani, Pwani, Matemwe, and Nungwi. Visit Kendwa Beach, Stone’s Cave, the sand dunes north of Nungwi, and Mokokotoni Village. Sneak off to the secluded beachfront property of the Hotel Mbweni Ruins 30 minutes outside of Stone Town for a lunch at their Rain Tree Restaurant where the jungle joins the dining experience. This open terrace, filled with the tropical foliage of the surrounding plant life overlooks the turquoise waters of the ocean. Walk along their secluded beach and dip your toes in the warm waters of ocean. Don’t leave Zanzibar without spending some time beneath the waves! Dive with dolphins, sea turtles, and sting rays, see clown fish, eels, and vibrant corals along the soft sandy depths of the waters surrounding the island. Choose from scooba diving or snorkeling, rent equipment if you’re a licensed diver, take a training course or work with a guide. There are so many ways to explore the depths of the waters surrounding the island, there are numerous ways to dive, but you won’t want to miss this unique experience! Spend a magical day of your Zanzibar honeymoon encountering the wildlife of Zanzibar with a visit to Cheetah’s Rock . This intimate encounter with cheetahs, peacocks, lemurs, lions, and zebras will be one of the most memorable moments of your stay! Cheetah’s Rock is not a sanctuary, and it’s not a zoo, its residents are rescued animals, or those bred in captivity. None are captured animals. Every day a limited number of visitors allowed every day are introduced to the creatures that call Cheetah’s Rock home. You’ll never forget your time at Cheetah’s Rock interacting with the wildlife in Zanzibar. In conclusion, no matter how you explore Zanzibar island, you’ll leave with beautiful memories of your time in Zanzibar and a yearning to return.